Colombia’s musical riches are so eclectic and extensive, they can hardly be explored in just one weekend. Nevertheless, the Colombian Festival will give you a sampler of the beautiful colors of Colombia’s musical palette as it brings us a stellar cast of artistas colombianos to celebrate Colombian Independence Day. 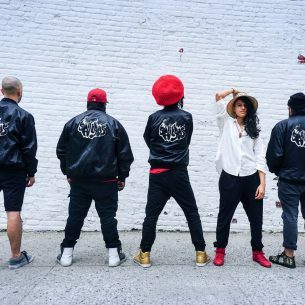 Here are some of artists that are sure to be a highlight this weekend at Kelvyn Park: M.A.K.U This punk-jazz-Colombian roots ensemble from Queens, NY, USA and Colombia recently released an EP that is pure fire, and aptly named, Cinco Fuegos. The video for the first single, “Por Encima,” involved the participation of the LGBTQI community in Colombia, and is an anthem to getting to where you need to go, no matter what it takes. Canalon de Timbiquí Hailing from the mining region of Timbiquí in Colombia’s Pacific Coast, Canalón de Timbiquí is an all-female vocalist and percussion band led by Nidia Góngora in fact, includes several women who are also miners. The profound Afrocolombian feelings that pour out in their golden voices and harmonized chants are as rich a treasure as the gold mined from Timbiquí. Rolling Ruanas A rocking roots band that fuses the rural music of the Colombian Andes with rock n’ roll and other contemporary beats, this is Rolling Ruanas’ take no prisoners, musically-speaking. So put your ruana on (a poncho-style outer garment from the Andes region of Colombia) and get ready to roll, and as the band puts it, dance from Tunja to Tijuana! Bazurto All Stars The vibrant Bazurto All Stars from Cartagena share the irresistibly danceable Colombian genre of champeta, and in the creating their “champeta muffin”, add a little urban flair and touches or reggaetón, connecting the dots between their AfroColombian/Caribbean beats and soukous- and by the way, the amazing Soukous All Stars, grand veterans of that African genre than was one of the main forerunners of champeta will also be playing at the Colombian Fest. Willie Colon We’ve just leave this video here for you. No explanation needed why you need to catch maestro Colón this weekend, right? 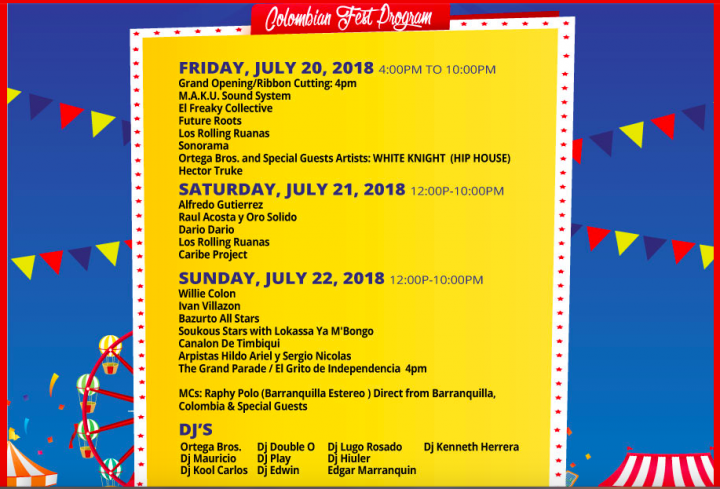 Here’s the lineup so you can check the schedule of the Colombian Fest/El Gran Festival Colombiano. See you in Kelvyn Park!